Dell is finally working on Android based tablet named as Dell venue 8. Its long since we heard any android tablet from the company. But now those who are eagerly waiting for the tablet from DELL can now breathe normally. 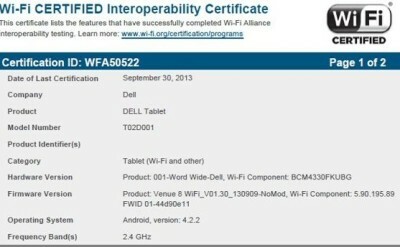 The Dell tablet (T02D001) has appeared on WiFi certification website. The company is already very much famous in the PC field and now wants to make its feet stable in the battle of android tablets. The the company will try to make its customers happy by including several new features in the tablet after all its company’s latest tablet after the 10 inch Streak. The device runs on Android 4.2.2 and comes with WiFi connectivity (2.4GHz frequency). Other specifications are not known yet, but considering its name it would have 8 inch capacitive touch screen display. The tablet would have quad core processor integrated with 1GB or 2GB of RAM. So stay Tune we will update if something new about the Dell Venue 8 pops up.